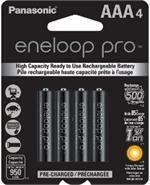 BQ-CC75-AAA: Smart Charger + 4xAAA eneloop NiMH 800mAh cells. NEW UPGRADED SMART CHARGER MODEL. 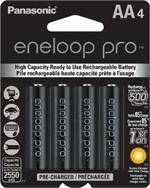 The ENELOOP batteries that come with this package are PRE-CHARGED & READY TO USE ! Charger has flip-out prongs on back, so it can be plugged right into a wall outlet. For worldwide use (100-240VAC 50-60Hz). 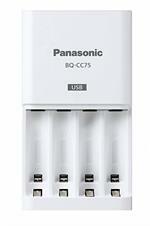 Charger is safe, smart, with automatic shut-off when the batteries are full. It charges 1, 2, 3 or 4 batteries at a time. It can charge AA or AAA size cells. 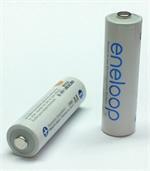 It can charge all 1.2v NiMH AA and 1.2v NiMH AAA battery cells. 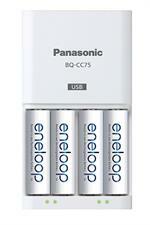 Charger also has built-in USB2.0 1A charging port - you can charge your smartphone & other mobile devices from this !